Tag Archives: Smoking is not allowed within 10 meters of a Seoul subway station. 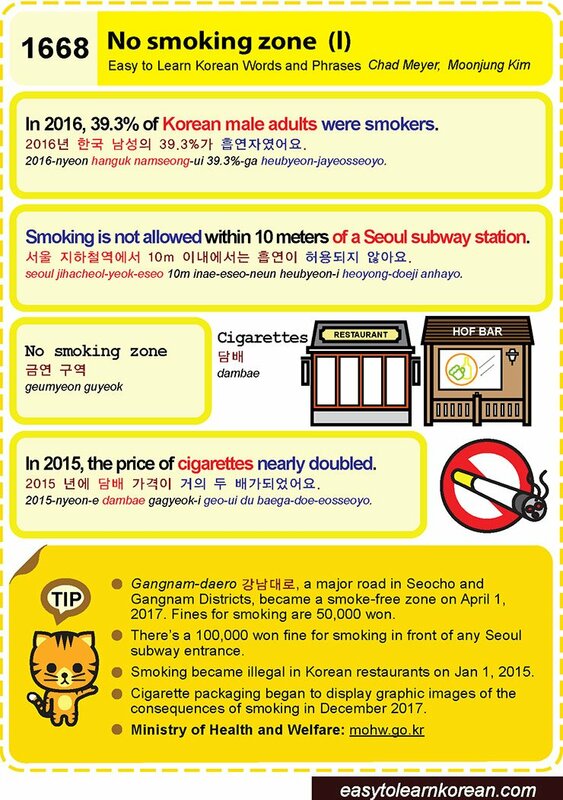 Easy to Learn Korean 1668 – No smoking zone (part one). Posted in Series	| Tagged 2015 년에 담배 가격이 거의 두 배가되었어요., 2016년 한국 남성의 39.3%가 흡연자였어요., 39.3% of Korean male adults were smokers., cigarette packaging, cigarettes, fine, Gangnam District, Gangnam-daero, In 2015, In 2016, Ministry of Health and Welfare, no smoking zone, Seocho, smoking, Smoking is not allowed within 10 meters of a Seoul subway station., subway entrance, the price of cigarettes nearly doubled., 강남대로, 금연 구역, 담배, 서울 지하철역에서 10m 이내에서는 흡연이 허용되지 않아요.